A rare find - a residential building lot on the flats close to the IGA. 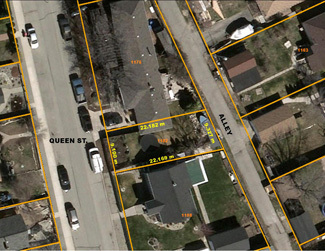 Despite its precedent-setting size City Hall approved the subdivision of this lot in an effort to encourage in-fill space in a neighbourhood of single-family homes. R2 zoning allows 40% coverage which results in a 907 sq.ft. building footprint. Add a finished basement and it's 1,814 sq. ft. A secondary suite is allowed. Covenant restricts overall building height to 18'. Alley access, flat site. Neighbour's fence to the south encroaches approximately 2' at the front and 7' at the back (survey markers in place).